Do you need a Romantic Date Night this Valentine's Day? 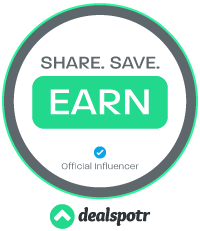 Mom Blog Society, Mom Does Reviews and many other fabulous bloggers are excited to give you a chance to win dinner out, flowers and a movie! 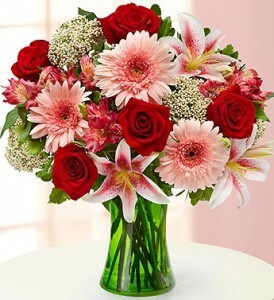 Your day will begin with a delivery of a beautiful Valentine's Day Bouquet. Whatever you're hoping, dreaming or wanting for this special day, these flowers will start you on your way! 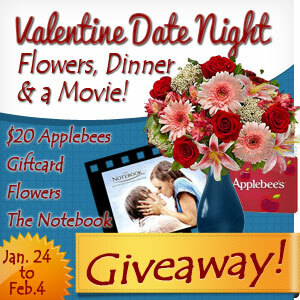 Next, grab your honey and head to your Neighborhood Applebees for dinner on us! Our bloggers are so fantastic, we have a $30 gift card, not $20! Don't think about the kids, jobs, dishes or dogs, just relax and have a fun night out! 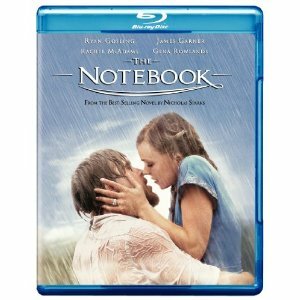 You will also win The Notebook, one of the most romantic "chick flicks" around. "Behind every great love is a great story. Two teenagers from opposite sides of the tracks fall in love during one summer together, but are tragically forced apart. When they reunite 7 years later, their passionate romance is rekindled, forcing one of them to choose between true love and class order." Giveaway starts at 1201am Jan 24, 2012 and ends Feb 4, 2012. Open to US residents only. Good luck!